The Action Camera has come into its own as a travel camera, and so before taking that it on your next trip, it is good to know the basics of using your action camera. Capturing memories on vacation is essential. Sure, your smartphones can capture a lot, but you need a camera that can really travel with you…and for this purpose, those little action cameras are perfect. They are waterproof, damage-proof, and can be mounted onto pretty much anything. An added bonus is that the camera shoots in fisheye (very wide-angle) mode, so you can capture everything. You just need these handy tips about the basics of using your action camera to get the best out of this must-have travel accessory. While action cameras look fairly simple with only a few buttons, it takes some practice and reading your manual to be confident and not intimidated when it comes to using your Action Camera. Here are three ways to step up your game using an action camera while traveling. First, the buttons: there aren’t many but know exactly how many functions each button has as which one does what – switch the camera on or off, toggle between modes, etc. You can adjust settings within different modes too. You can turn on wi-fi with your button too. One button will enable you to take photos or start and stop video recording. Make sure you select the right mode, and know how to do it effortlessly before you take your camera out to record. Know how to use the time lapse mode which allows you to take a photo at an interval chosen by you, and is great for selfies. Select the right accessory. There are dozens of accessories and mounts. 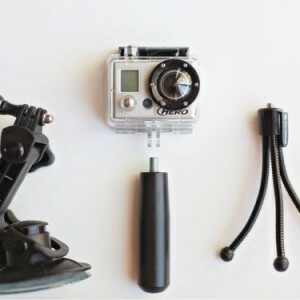 Read up which are the basic few which will serve any kind of purpose you have for your action camera. Once you know the basics of using your action camera, you will be able to then get more creative and experiment on the go. Thinking of combining your travels with a study abroad experience to learn English? Since 1998, TALK has brought students from all corners of the world together to the USA to learn English. Our vision is about a world where communication, understanding, co-operation and respect exist between people of all countries and cultures. At TALK, we believe the best way to learn English is to be fully immersed in American culture both inside and outside of the classroom. Learn More About TALK.